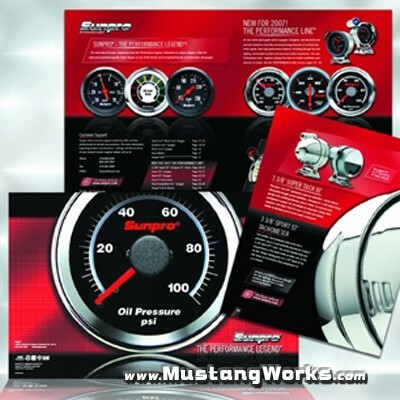 The 31-page, high-gloss, four-color catalog is the single best source for information about Sunpro's exciting line of performance tachometers and gauges including the new Sport ST(tm) and Super III(tm) brands as well as traditional Style Line(tm), Custom Line(tm) and 2-inch Retro Line(tm) offerings. Large, highly detailed product images make the new catalog visually dynamic. All products are accompanied by bullet points that highlight their particular features and benefits. Of special note are 3 3/8-inch versions of popular Sunpro tachometers. The smallish Super III(tm) and Sport ST(tm) brand tachs fit conveniently on most dashboards where space is limited and created excitement among classic and muscle car enthusiasts in 2007 when they were exhibited at Hot Rod Power Tour(tm), Goodguys Rod & Custom and National Street Rod Association events.